As an assistant professor and later director of graduate studies at the University of Missouri's School of Health Related Professions in the 1970s, Thomas Dolan looked around and saw a lot of similar students. The civil rights movement had burst onto the American scene in the preceding decades, and now the women's movement was in full swing—particularly on American campuses. However the future healthcare leaders didn't seem to reflect the changes underway in society, Dolan thought. But Dolan, who grew up with stories about his mother's time working as a nurse, including her service in Wales during World War II, was in a position to do something about it. That was just the beginning of a long career in healthcare and association management that took Dolan from Missouri to St. Louis University, and then out of academia to the American College of Healthcare Executives, where he would pursue that same goal of diversity on a larger scale. 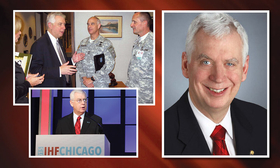 Dolan, who was recruited to the ACHE in 1986 by Stuart Wesbury, then the association's chief executive, became president and CEO in 1991 and served until his retirement in 2013. He is now president emeritus. At the ACHE, Dolan had a similar realization. The organization's board was nearly all white and male. And it wasn't clear what the membership looked like racially, because the organization didn't track it. Dolan led an effort to start collecting information on ACHE members' racial makeup. From there, he led the first career study to look at how minorities were progressing in the healthcare management field, and found that, after controlling for age and education, black executives weren't moving up the career ladder as far or as fast as whites. “So there was some sort of discrimination there,” Dolan said. The ACHE, at Dolan's behest, began issuing recommendations on how to change that, including suggesting more mentoring of young, minority executives and emphasizing networking opportunities for minorities. But Dolan also believed that if a professional organization wanted to encourage diversity in the field, it ought to be diverse itself. Dolan made it a mission to diversify the staff while expanding opportunities for members. “He really lived and breathed diversity,” said Karen Hackett, now CEO of the American Academy of Orthopaedic Surgeons, who was the executive vice president and chief operating officer of the ACHE from 1995 to 2003. Dolan—who has also chaired the boards of the American Society of Association Executives, the Association of University Programs in Health Administration and the Institute for Diversity in Health Management and served a two-year term as president of the International Hospital Federation—is being honored for his lifetime of achievement with induction into the Health Care Hall of Fame. While Dolan's tireless efforts to make healthcare's leadership ranks more diverse undoubtedly had a lasting impact on a generation of executives, he also made a deep personal impact on those who worked more directly with him, Hackett said. Dolan pushed hard for his staff to advance their own careers and get more advanced credentials and education. “He spent a lot of time on the development of staff, and he had high expectations of us,” said Chuck Macfarlane, CEO of the American Association of Diabetes Educators. Macfarlane worked at the ACHE from 1990 to 2006, including stints as vice president of regional services and vice president of education. And many who worked for Dolan and went on to become CEOs like Hackett and Macfarlane still turn to Dolan for counsel. While Dolan said he's proud of his efforts to diversify the field, he most enjoyed helping members and staff do their best work and move up because of it. Dolan also oversaw the formation of local chapters of the ACHE, which had previously only been a national organization. Now there are about 80 chapters across the country, which increases the ability of members to participate in educational programs. “It gives people more of an opportunity to be involved, by serving on boards at the local level,” Dolan said. That furthers their ability to advance their careers. During his leadership at the association, total membership grew from just over 20,000 when he became CEO to more than 44,000 when he retired. As for the ongoing effort to diversify the field, Dolan is optimistic. “It is changing,” Dolan said. “As a field we are in better shape. We have a higher proportion of women and people of color in leadership.” And, he believes, it will only get more diverse. “Gen X and the millennials don't see some of the differences older people saw,” he said. David Royse is a freelance writer in Chicago.